Christmas Shoeboxes filled for the children in Mexico. 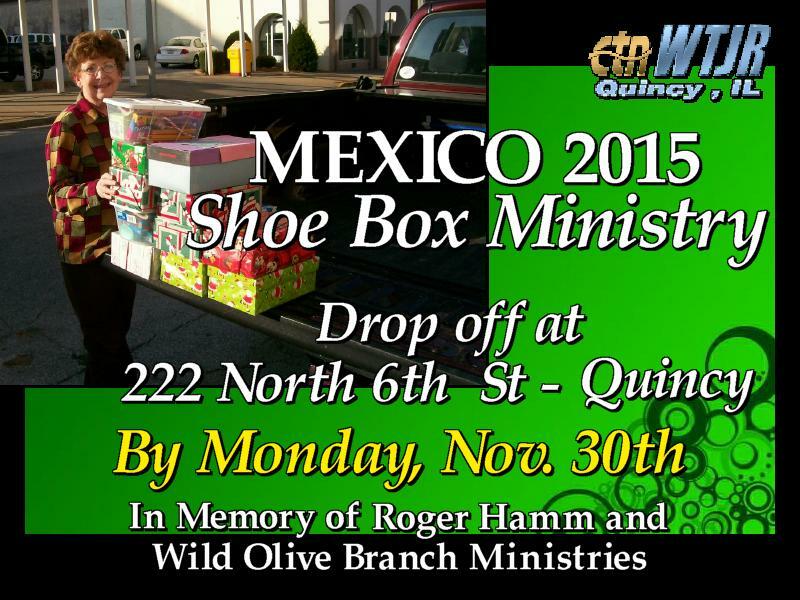 WTJR and Friends of Wild Olive Branch Ministries will be collecting shoeboxes for the children in Mexico. You can drop off your shoeboxes at the WTJR TV Studio located at 222 North 6th Street, Quincy, IL. - 2nd floor – elevator available. Be sure and mark on the box if for a boy or girl and the age. If you use a cardboard box please wrap the lid separate from the box; if using a plastic shoebox you can just put a rubber band around it to hold shut. Some suggestions for your shoebox: bars of soap, wash cloths, tooth paste, tooth brush, combs, hair brush, pencils, erasers, crayons, small notepads, glue, scissors (rounded not sharp points), sunglasses, small stuffed animals, socks and hard candy. For boys: small cars, trucks, balls. For girls: barrettes, jewelry, small dolls. Please – NO Food items or Expensive gifts! For those who can not get out and purchase these items, donations can be given to help with gas and travel expenses. “Thank You” in advance for Giving!